The Convair B-36 “Peacemaker” was a six-engine, very heavy bomber produced to meet specifications issued by the Army Air Corps on April 11, 1941, for what appeared at the time an impossible task: an intercontinental bomber. 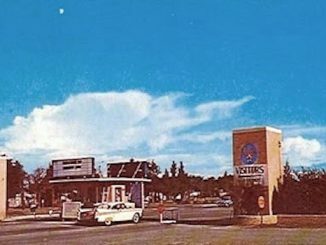 Four answers to the proposal from industry came with the Convair Model 36 being selected for development. As the world’s first truly intercontinental bomber, the B-36 was capable of flying (unrefueled) from bases in the United States and delivering at least 10,000 pounds of bombs on targets in Europe. B-36s were manufactured by Convair in one of the world’s largest industrial facilities at the time in the companies Ft. Worth, Texas facility. The B-36 sat on tricycle landing gear under a long, tubular pressurized fuselage stretching over 162 feet. The first prototype had a streamlined cockpit which was replaced by a bulbous, ‘greenhouse’ style cockpit on all subsequent aircraft. The massive wing had a gentle sweep angle and stretched 230 feet. The wing and fuselage met high on the fuselage and the wing was over six feet thick to allow interior access to the six pusher engines in-flight. Two podded General Electric J47-GE-19 engines were added under the wings outside of the pusher engines to B-36B and all subsequent models to provided augmented thrust. These early jet engines aided the B-36 during take-off especially while providing an extra margin of performance for safe operation in critical phases of flight and increased speed at altitude. A single, gently swept vertical tail made the aircraft almost five stories. The tail section included swept horizontal tail planes with massive elevators. Tinker’s role with the B-36 began exactly one year after the aircraft first flew. On Aug. 8, 1947, Tinker was designated as the repair facility for the new strategic bomber program. 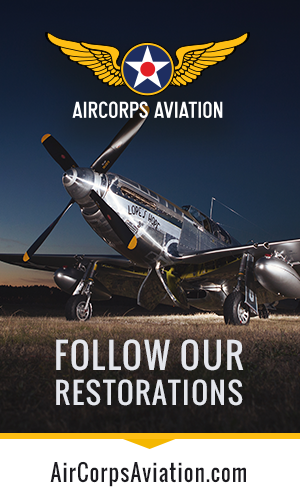 In the run-up to initial operational capability Tinker began stocking parts for the aircraft in March 1949 and training maintenance personnel in the skills required to repair and maintain the Peacemaker, according to Tinker History Officer documents. 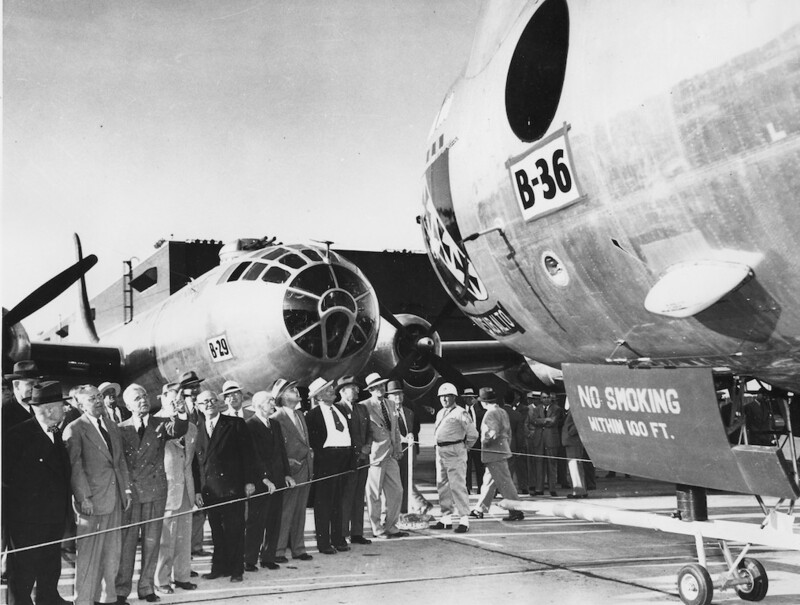 On May 27, 1949, the first B-36 was inducted in to the Oklahoma City Air Materiel Area for ‘repair.’ Additional B-36s were sent to OC-AMA for repair, but this maintenance work was likely not truly a repair, but the modification and installation of the aircraft with J47 jet engines. The B-36 had a three year development period and became operational in 1950. Tinker’s final work of note for the B-36 program began in Dec. 1951 when OC-AMA began modifying B-36s to carry atomic weapons. There were 27 B-36s processed through Tinker AFB between 1949 and 1951. There were multiple operational versions of the B-36 to include 17 strategic reconnaissance RB-36Ds with 14 cameras installed in two of the aircrafts four bomb bays. 156 B-36H aircraft were also delivered to the Air Force which incorporated an improved flight deck. 72 of these also had reconnaissance capability. One H-model aircraft carried a self-contained nuclear reactor aloft to better understand how radiation effected the airframe, equipment and personnel. The final version of the B-36 came in the J-model which had additional fuel tanks installed in the outer wings which took the aircrafts gross weight to 410,000 pounds. This required all 33 B-36Js to be fitted with strengthened landing gear to support the increased aircraft weight. 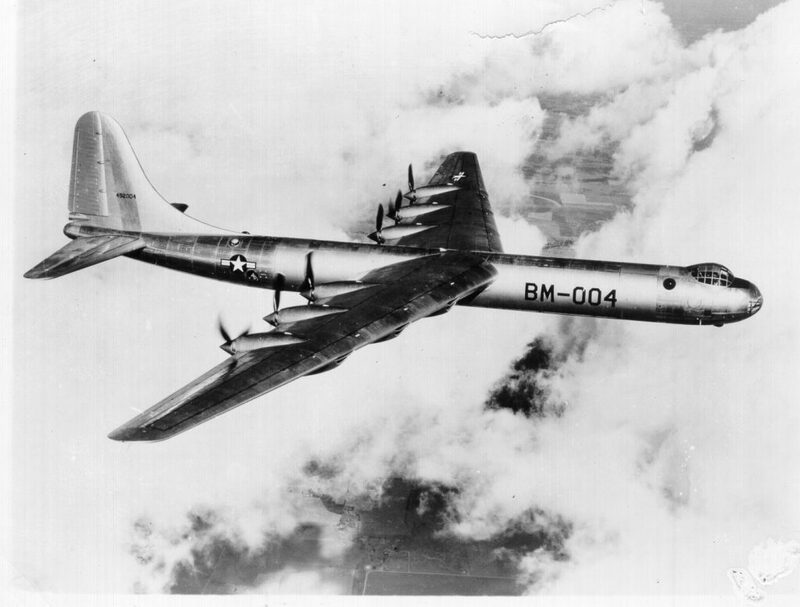 The B-36 Peacemaker became the most visible symbol of Strategic Air Command’s deterrence role in the nuclear triad during the 1950s. 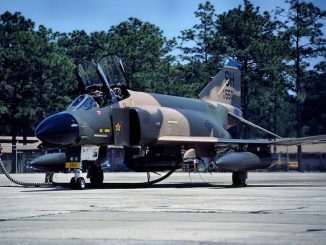 The aircraft was capable of operating in all-weather, day or night and had the ability to fly intercontinental distances which meant the Peacemaker kept the peace with the Soviet Union by posing a credible threat. 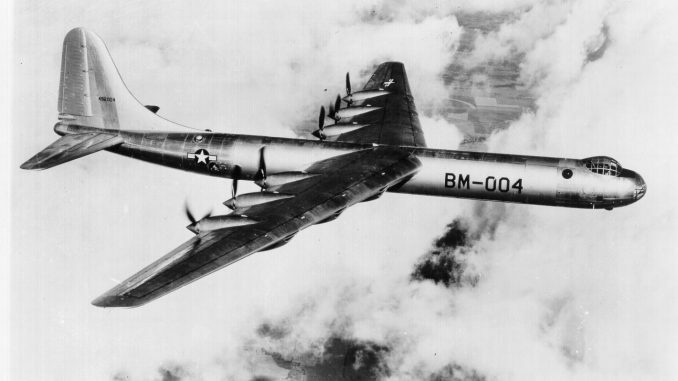 In other terms the B-36 isn’t viewed as a great success because it had a short-lived operational life (9 years) and was quickly replaced by the all-jet powered Boeing B-52 Stratofortress bomber, which still flies today. While there are no flying B-36s in the world, the Peacemaker continues to influence airpower today as the facility where they were made in Ft. Worth, Texas is currently the production line for Lockheed Martin’s F-16 Fighting Falcon (final aircraft produced in this specific facility recently) and LMs F-35 Lightning II.